GE Osmonics Pentair CTA-16 RO Membrane is a 12" x 2" standard residential replacement cartridge with a 16 gallons per day capacity of pure drinking water. 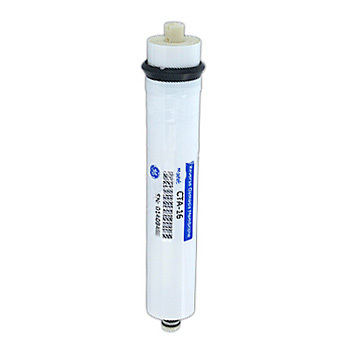 The Pentek GE Osmonics CTA-16 RO replacement water filter membrane reduces lead, mercury, chromium, nitrates and many other pollutants and contaminants. This CTA(Cellulose Tri-Acetate) membrane is made of cellulose acetate, which means it is chlorine resistant and will not wear out easily. Pentair CTA-16 is manufactured with "Membrane-Separation Technology" which employs cross flow filtration where captured impurities on the membrane are constantly swept away by the concentrate stream. Cross-flow filtration across the membrane then divides the flow into two outflow streams: the cleansed permeate feed and the concentrate or reject stream. This flow provides continuous cleaning that prolongs membrane life and reducing maintenance costs. Membrane elements by GE are the brand of choice for most demanding applications. GE drinking water filters reduce many pollutants and contaminants with a premium membrane process that removes particles 100,000 smaller than human hair. The elements deliver outstanding performance and long-lasting operation. 16 gallons per day capacity. * Permeate flow specifications are based on 500 mg/L NaCl solution at 65 psi (4.5 bar) inlet pressure, 77°F (25°C), 15% recovery after 24 hours. Individual element flux may vary ±15%. ** Filters and membrane elements are not to be installed on micro biologically unsafe water supplies. Membrane Elements by GE are not certified to sanitize water, remove cysts, bacteria, or viruses. Filter and membrane element performance can be affected by fluctuations in water quality. 3 Stage RO System Ametek / Kleen Plus RO-2127 , WSRO10C HDRO-10AG Replacement Filters, Bruner DWS-1 DWS-2 V15 Filters , EcoWater ERO 200 RO System , Hague H2000 , Hague H2500 , Lancaster model with Fitting at the bottom of Membrane Housing , Marlo Standard Series Microline model with Fitting at bottom of Membrane Housing , Pure-Tel RO-10 , CTA-5 Reverse Osmosis system , Residential RO Membranes TGI-315 & 315TFC , Three Stage 15gpd RO Replacements for Water-Right model with Fitting at bottom of Membrane Housing , ROM16C , ROM-16C , ROM-16-C , ROM16-C , Fastek 8205-096 8205096 , and many more. - The DESAL-TFM-18 does not reduce fluoride.